If you’ve landed on this page, you’ve probably sat down to edit a fantastic video together with some great footage you recorded earlier, only to find out that your mobile phone has interfered with the recording. A bit like this: “click click click buzzzz buz”. Onomatopoeia? Nailed it. We’ve been there, we know how you feel. You’ve just had that horrible sinking feeling that you might have to re-record all the footage or just scrap the project altogether. Mobile phone interference is actually called ‘GSM buzz’. We’re not going to pretend how it works – we’re not that technical. We just know, as you do, that it ruins video footage. Well, don’t worry. This blog is going to act as a step-by-step guide that you can use to clean that crackly, distorted audio and make it sound like the phone never got anywhere near your camera. We managed to save our audio from total mobile interference destruction for free using Final Cut Pro X. Here’s our example followed by a guide to how we did it featuring our lovely friends Tim and Paul – definitely check them out. Here’s how we cleaned it up. You’re going to need a tool called RX 6 by iZotope. Don’t worry, if you’re using Final Cut Pro you don’t need to pay the £300 or whatever it is for the full version, just download the trial for now by clicking the “try” button. iZotope have a great portfolio of audio repair software. We had a play around with RX6 and some of the features are cool. The trial version you have downloaded lets you try them all out but won’t let you save the edited audio file. Open up Final Cut Pro and import the video file you want to work on. On the right-hand side, you’ll see the different sections for effects and transitions. Click the “effects” section (highlighted blue in the top-right corner of this screenshot) to display all the different categories of effects, both audio and video. Because you downloaded your fantastic new trial for iZotope RX6 earlier, you’ll have a brand-new section of audio effects which you can apply to your affected footage. In particular, we’re going to be looking for the “RX6 De-click” and “RX 6 Mouth De-click” effects. Locate these effects and you’ll be ready for the next step. Once you’ve located the effects mentioned above, simply drag the box on to your footage affected by the mobile interference. If you do this for both of the audio effects, it will apply them to the audio. Your audio has just been “de-clicked”. You’ve still got one thing left to do. With your footage selected in the editing timeline, click the little audio symbol in the top-right corner and scroll down to see the effects that you have applied to the selected clip. It’s important to ensure that both audio filters (the RX 6 Mouth De-click and RX 6 De-click) have the sensitivity turned up to the max. It’s in the “parameters” drop-down section on each filter. This is so it gets rid of every darn click that’s ruining your day. And that should be it. Have a playback and make sure the sound is okay. If you’re still hearing a bit of a rumble, you might want to lower the volume of that particular section. 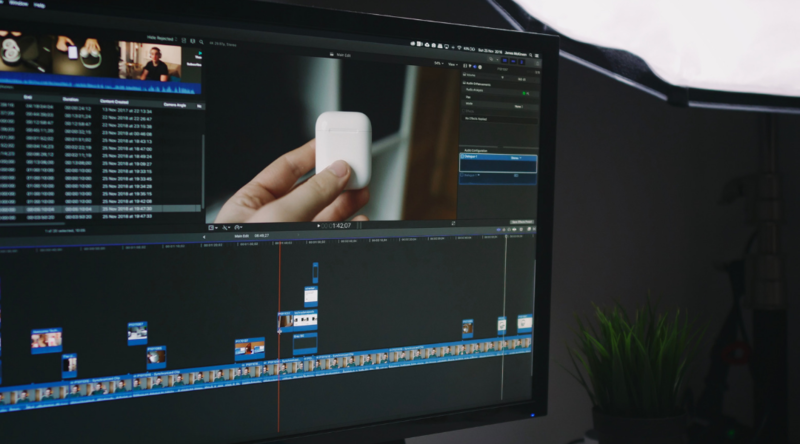 Hopefully, this blog will save you from wasting time re-recording your video footage or, even worse, losing the project altogether. Further information on how we can help you with your video requirements can be found here.